Mouse anti influenza A H1N1 hemagglutinin antibody, clone C102 (5315-2907) used to measure hemagglutinin levels using Raman spectral scattering. SERS spectra of the half sandwich assay with three different kinds of influenza H1N1-VLPs (red), H3N2-VLPs (green), and H5N1-VLPs (blue) against a series of antibodies. The Raman signal at 1290 cm-1 from the NC membrane is consistent and used as an internal standard here. Bar graphs show the intensities of the SERS peaks at 1340 cm-1 for different subtypes of influenza VLP. A Rapid and Sensitive Early Diagnosis of Influenza Virus Subtype via Surface Enhanced Raman Scattering. Mouse anti influenza A H1N1 hemagglutinin antibody, clone C102 (5315-2907) used for the evaluation of viral load in MDCK cells by flow cytometry. Binding of porcine NKp46 Ig fusion protein to of influenza A virus infected MDCK cells analysed by flow cytometry. Cells were gated according to forward/side scatter characteristics. 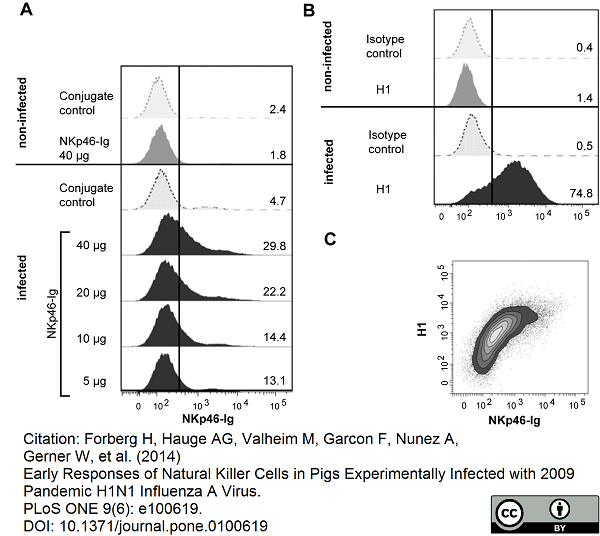 (A) Histograms show binding of different concentrations of NKp46-Ig to infected cells. Percentages of positively stained cells are indicated. (B) Infected as well as non-infected MDCK were stained with anti-H1 mAbs. Corresponding isotype-matched irrelevant mAbs and secondary antibodies only served as controls. (C) Double staining for H1 and the highest concentration of NKp46-Ig are shown on influenza infected cells. Results are representative of four independent experiments. From: Forberg H, Hauge AG, Valheim M, Garcon F, Nunez A, et al. (2014) Early Responses of Natural Killer Cells in Pigs Experimentally Infected with 2009 Pandemic H1N1 Influenza A Virus. PLoS ONE 9(6): e100619. Mouse anti Influenza A heamagglutinin antibody, clone C102 recognizes the haemagglutinin of the Influenza A H1N1 serotype and does not react with H2N2, H3N2, Influenza B, RSV, Parainfluenza I, II or III, Adenovirus, mumps or measle antigens. Mouse anti Influenza A heamagglutinin antibody, clone C102 has been used sucessfully for the detection of H1 influenza virus in a Surface Enhanced Raman Scattering biosensor assay demonstrating lack of reactivity with either H3 or H5 influenza A strains (Lin et al. 2014). Lin, Y.J. et al. 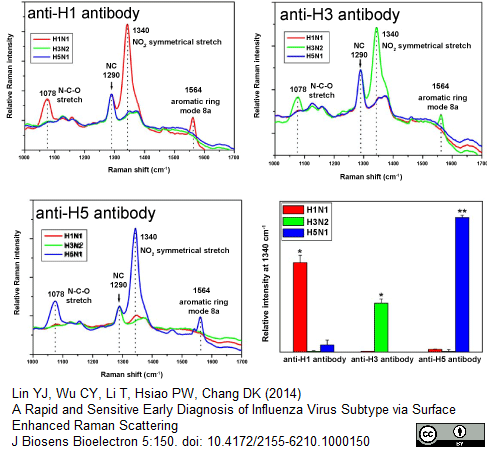 (2014) A Rapid and Sensitive Early Diagnosis of Influenza Virus Subtype via Surface Enhanced Raman Scattering. J Biosens Bioelectron 5: 150. Forberg, H. et al. (2014) Early responses of natural killer cells in pigs experimentally infected with 2009 pandemic H1N1 influenza A virus. Canelle, Q. et al. (2016) Evaluation of potential immunogenicity differences between Pandemrix™ and Arepanrix™. Hum Vaccin Immunother. 12 (9): 2289-98.